But second, every product you’re selling, every goal you have now exists in a brutally competitive market where your potential customer can quickly and easily leave your website and choose anyone from the behemoth Amazon to an eBay seller operating out of a garage instead of your company. So how do you compete? 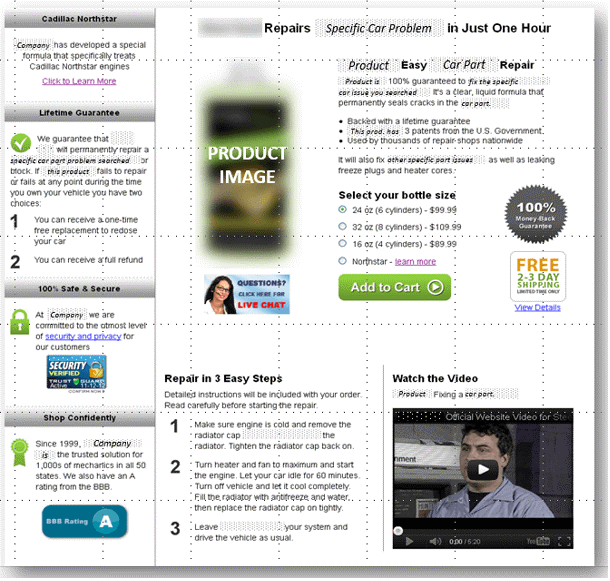 How do you increase your conversion rate and sell more products? I can’t give you a specific answer. But I’ll tell you who can — your customers. With A/B testing, you can discover what really works on your brand’s website, in your brand’s email, and in your brand’s ads with your brand’s prospective customers. 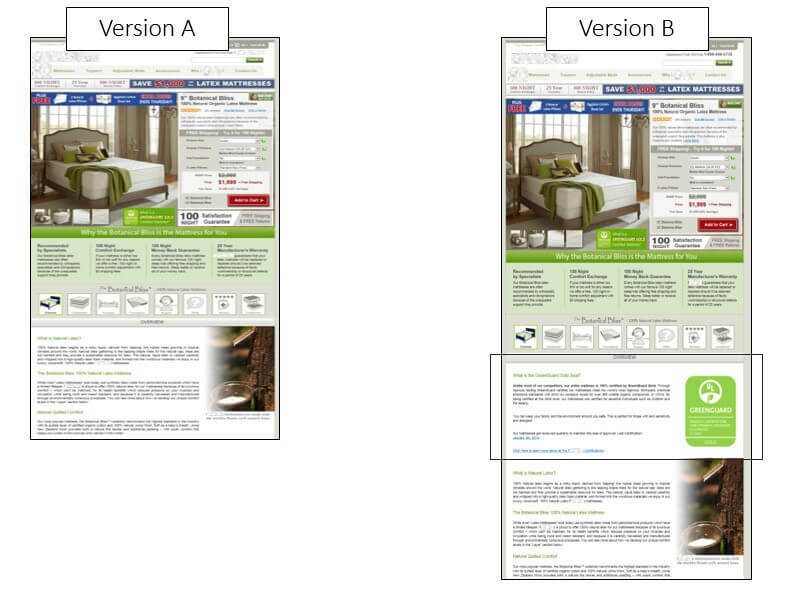 To give you ideas for tests on your website, we put together this swipe file of 25 ecommerce experiments that MECLABS Institute analysts conducted in Research Partnerships with ecommerce companies to help them learn about their customers and improve conversion rates. 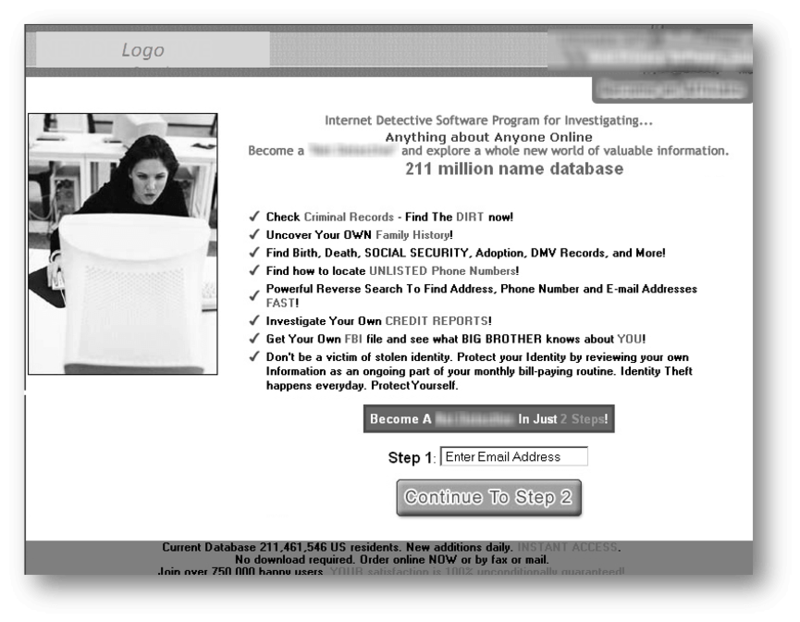 There’s a lot of information here, and different people will want to go through this swipe file in different ways. You can scroll through the webpage you’re on and use the anchor links. Or use the form on the page to download a PDF with all of the experiments, including a table of contents and internal anchor links to help you navigate. If these experiments inspire your own tests, we’d love to see the results — just drop me a line at d.burstein@meclabs.com. P.S. If you need help improving conversion, just drop me a line as well. MECLABS analysts can work hand-in-hand with you to apply our patented methodology to your conversion challenges. plus, you’ll receive regular emails from MECLABS Institute. 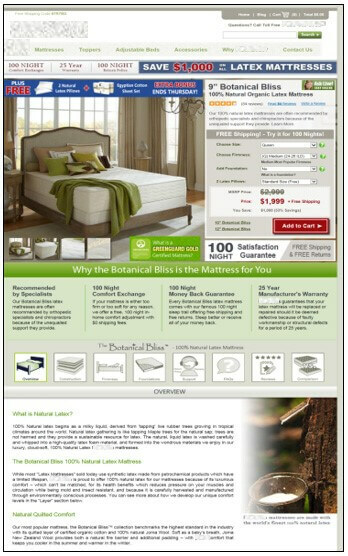 The product is an organic latex mattress. It is one of only a few mattresses that is GreenGuard Gold certified. In the control, the certification is present but de-emphasized. 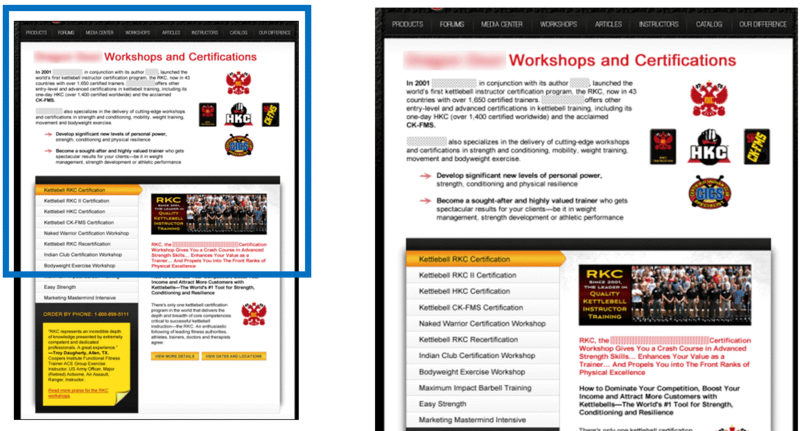 There is also no explanation to help the customer understand why they should value this certification. What You Need to Understand: The increased clarity around an exclusive source of third-party credibility increased the value exchange and appeal of the product driving more sales. 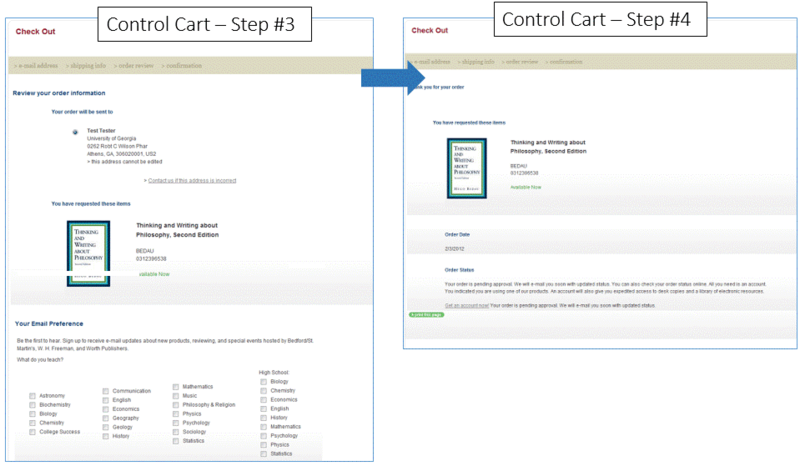 Research Question: Which cart page will generate the highest completion rate? 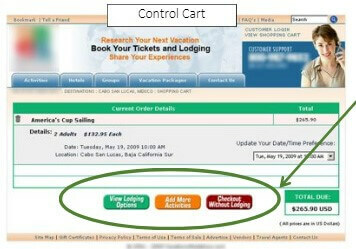 The original cart was simple, but it included three equally weighted options from which the visitor had to select. This made the checkout process unnecessarily cumbersome. 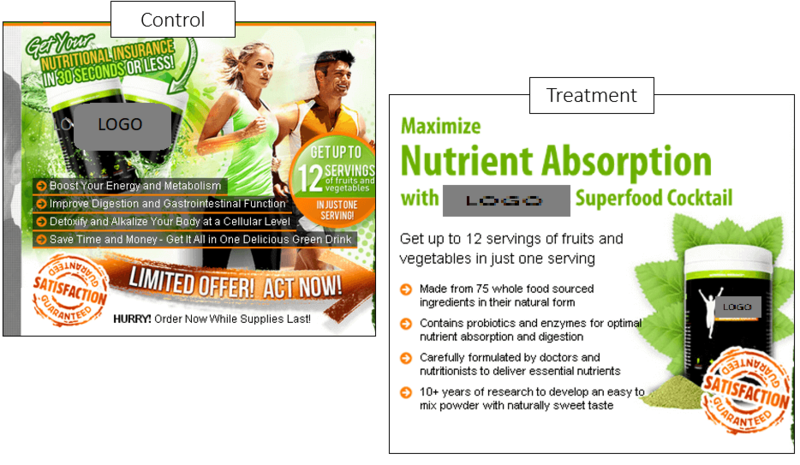 The marketers de-emphasized and integrated the additional options into the product details. 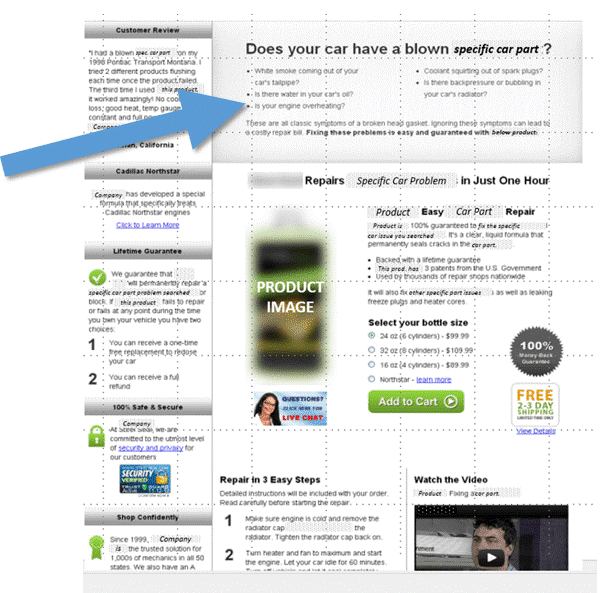 And they focused the visitor on one main call-to-action here. 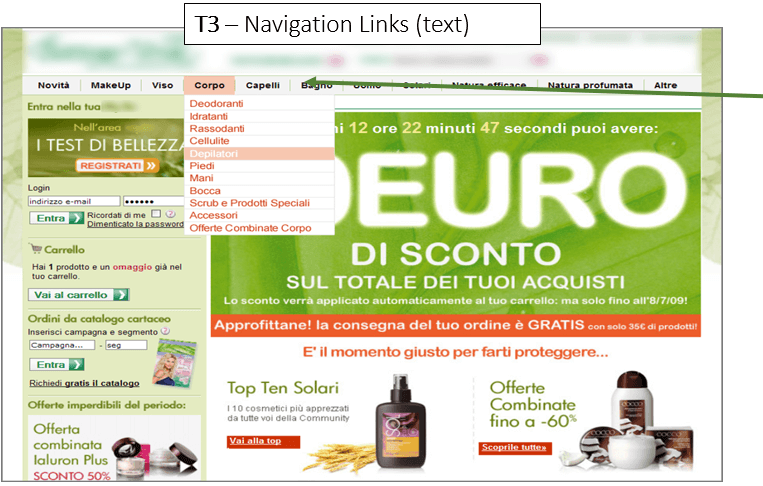 What You Need to Understand: By moving the secondary CTAs to the relevant cart sections and putting emphasis on a single CTA to move the customer forward friction was reduced and conversion increased. 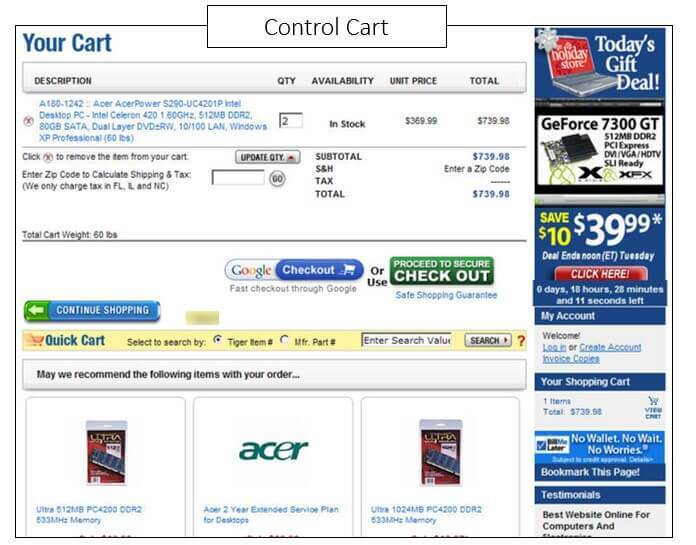 Research Question: Which treatment will generate the highest conversion rate and revenue per cart? 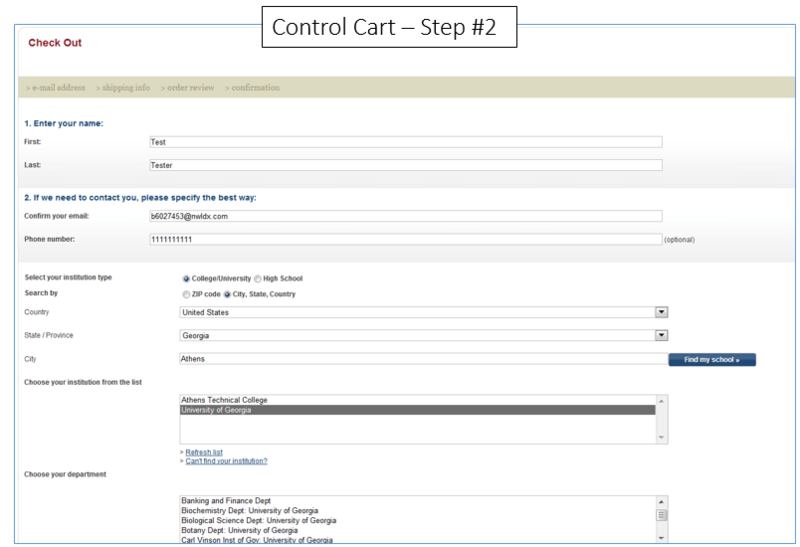 A closer look at the control cart page reveals that all supporting content is focused on making an upsell. The treatment, however, changes focus to reduce potential anxiety. 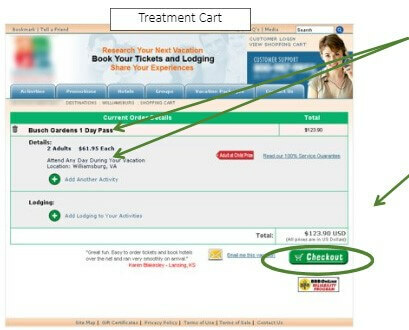 What You Need to Understand: By addressing anticipated anxiety at the critical decision through the use of testimonials and clear trusted payment options, the treatment generated 3.69% more sales in addition to 11.6% more revenue per cart, resulting in a projected $53,000,000+ annual increase in revenue. 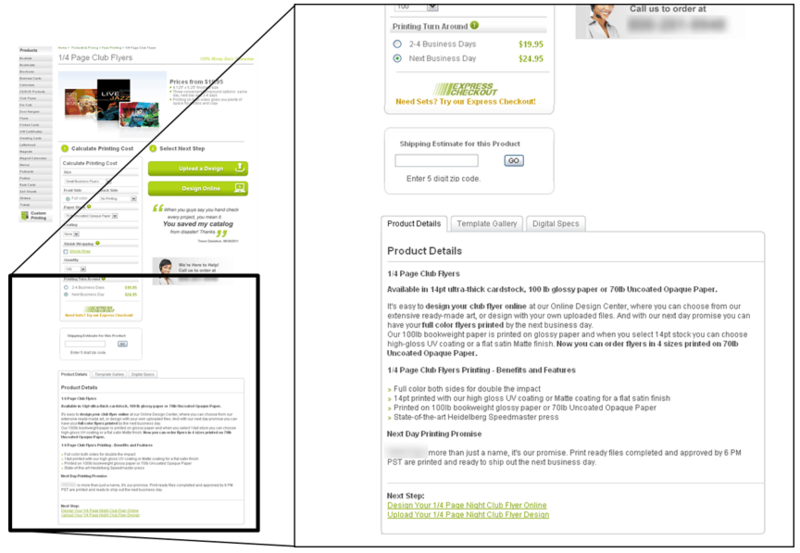 Research Question: Which product page will result in the largest purchase rate? 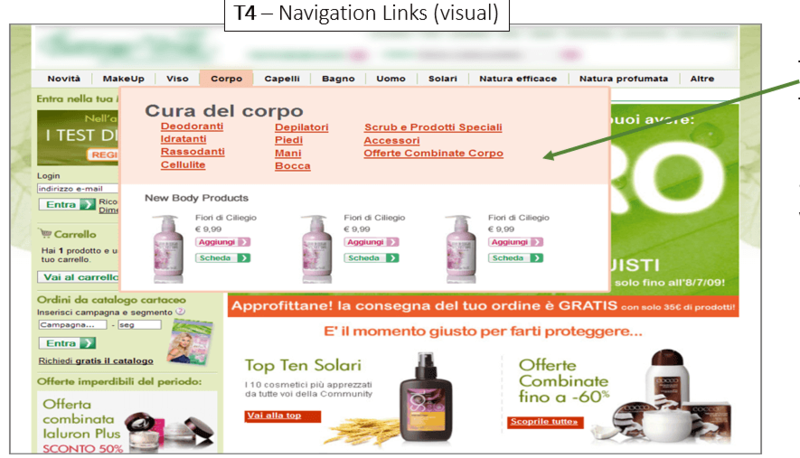 What You Need to Understand: By resequencing the page to put the form first and better match motivation and clarify the eye path, the new product page template achieved an 87.40% increase in conversions. 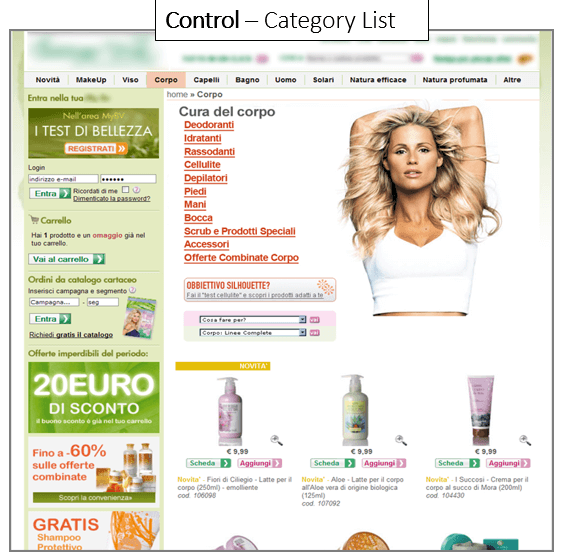 Background: Italian ecommerce website offering cosmetics. 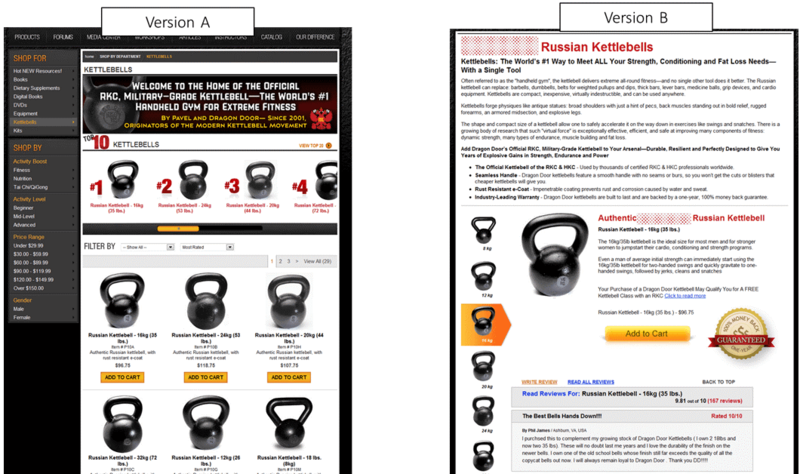 The researchers were focusing on testing different approaches to the "body" category page. 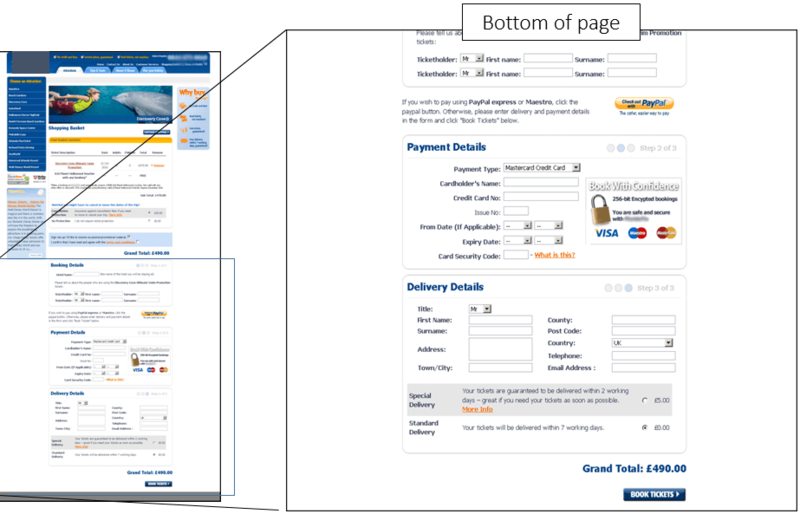 Research Question: Which page will generate the highest rate of conversion? 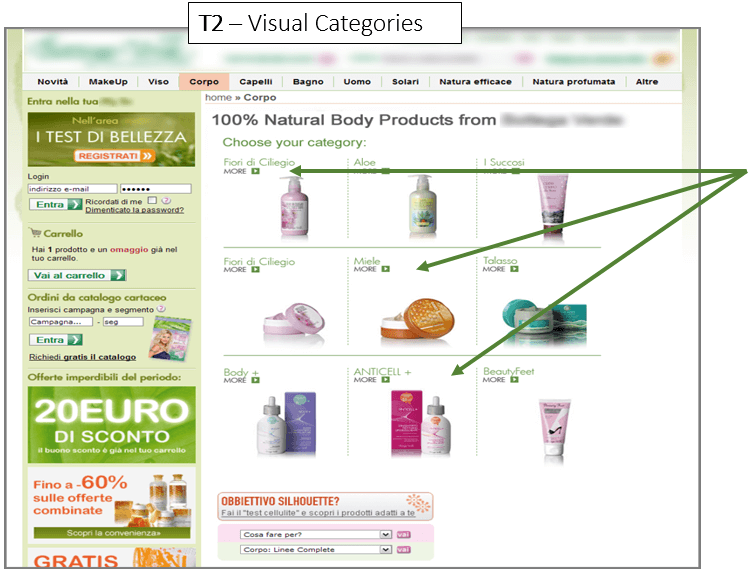 Is the category list at the top of the page the most user-friendly way to present the information? 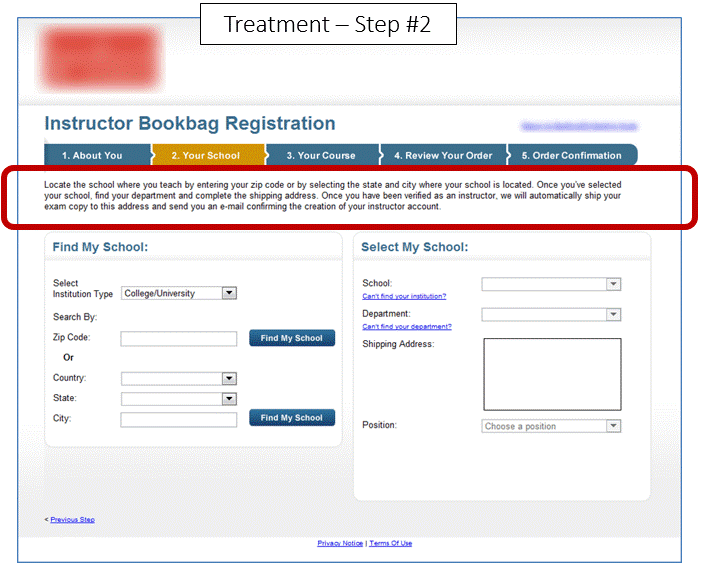 Treatment 1 seeks to make the page easier to use by adding an interactive configurator that enables the visitor to customize the products that show up below. 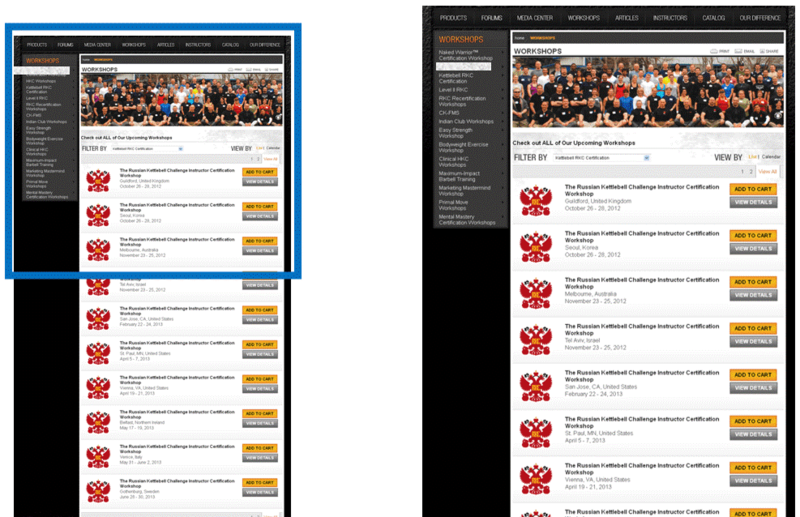 Treatment 2 seeks to make the page easier by removing the category links and simply featuring the main categories with images. 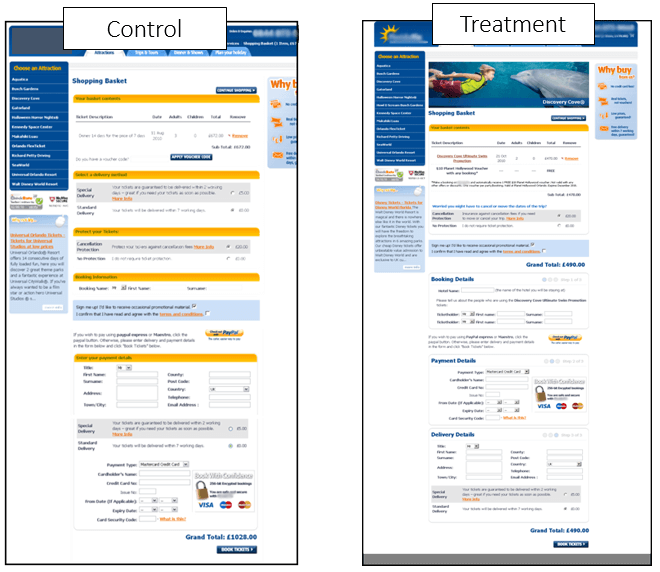 Treatment 3 is a radical approach that seeks to make the process easier by removing the “body” category page altogether, enabling the visitor to choose their category within the navigation of the homepage. 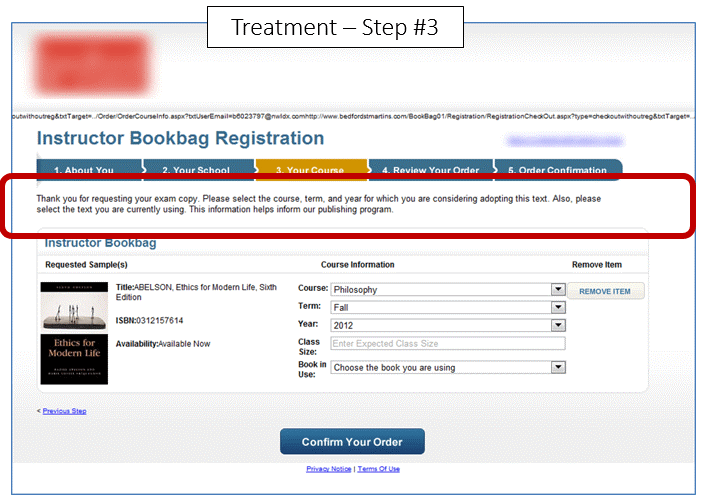 Treatment 4 is similar to Treatment 3, only it integrates a more visual approach to the categories within the navigation. What You Need to Understand: By adding an interactive element, the new product page achieved a 20% increase in conversions. 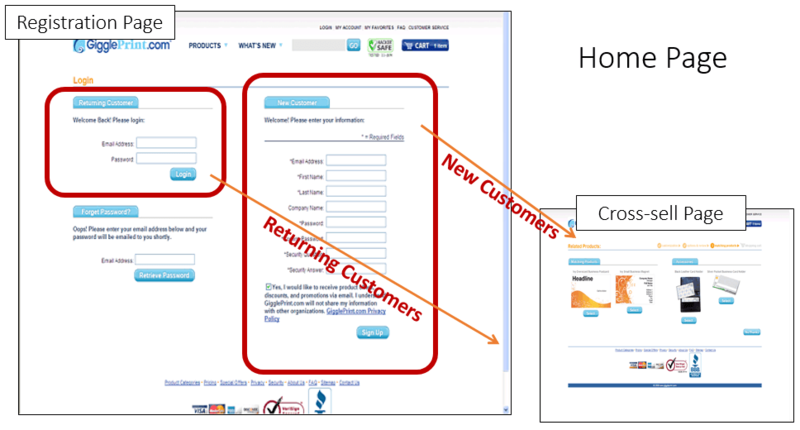 Research Question: Which version of a second step in the conversion funnel will produce the highest conversion rate? 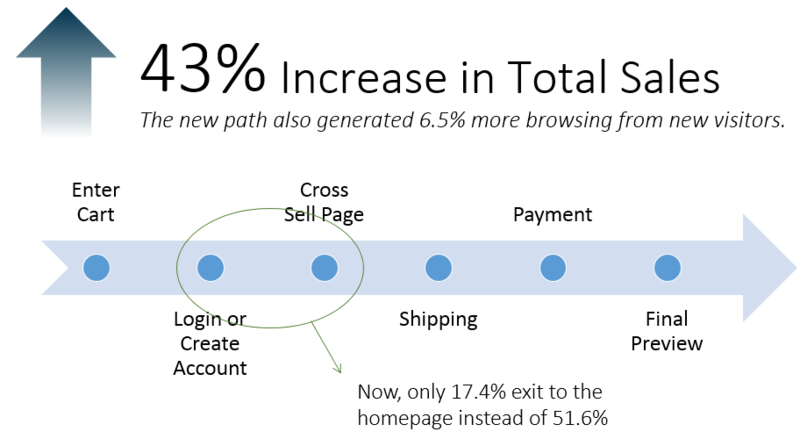 When we analyzed the metrics, we realized there were leaks throughout the checkout process. 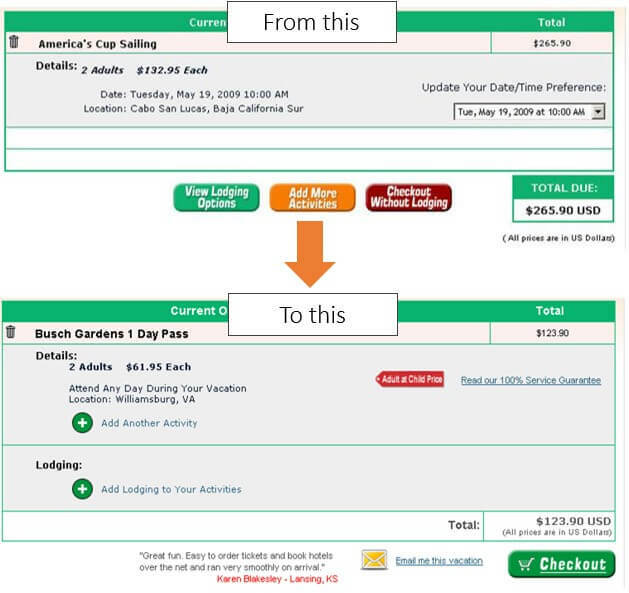 The credit card submission page stood out as low-cost opportunity for immediate return. When we analyzed the metrics even further, we saw that this step also had the highest lost revenue per cart (more than double compared to any other step). From this, we hypothesized that optimizing this step would have the highest potential return on our efforts. What might be causing the fallout? It is unclear why the credit card is required when payment method is different. The complexity of the purchase agreement terms causes confusion and concern. 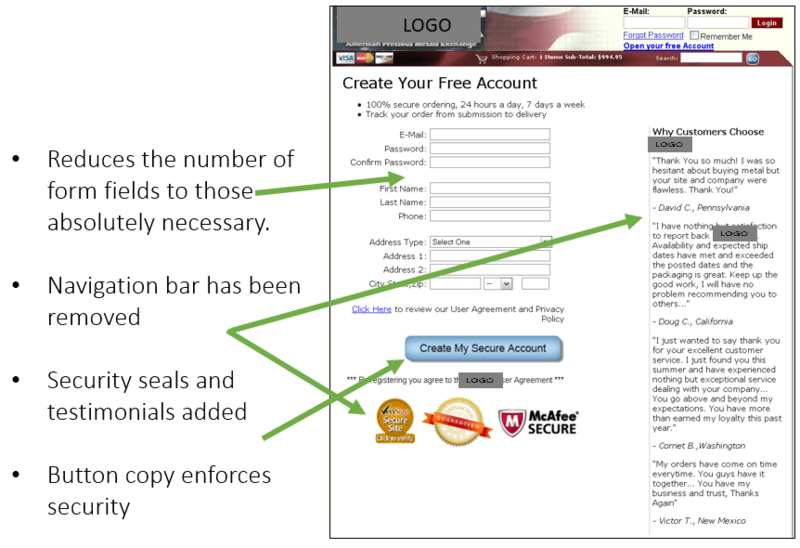 There is no indication that the customer’s credit card information is secure. Third-party security indicators have been added. Clearer explanation of why a credit card is required and that it will not be charged. “Satisfaction Guaranteed” promise is emphasized. What You Need to Understand: While it might seem like a small increase, the changes in this treatment on this step of the funnel resulted in a projected $500,000+ increase in revenue per year. This underscores the potential impact of a properly identified research question. 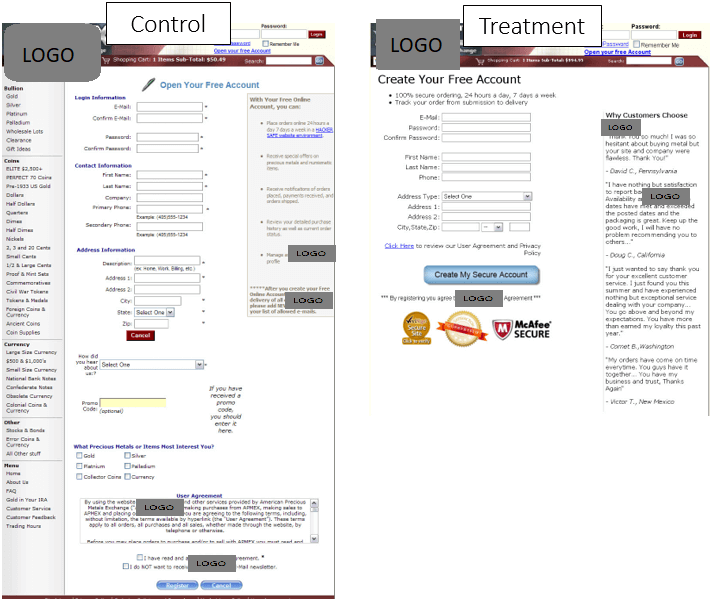 Research Question: Which page will generate the highest email capture rate? 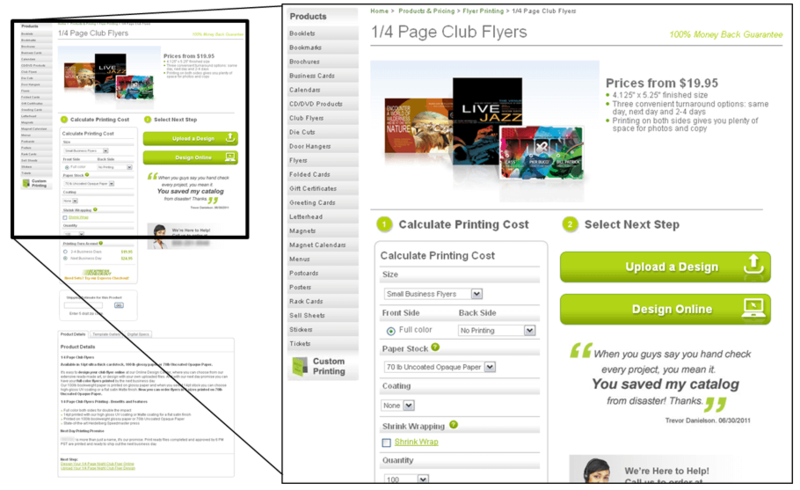 When a visitor clicked “Order Now” they were then directed fill out a single-page form with their payment information. 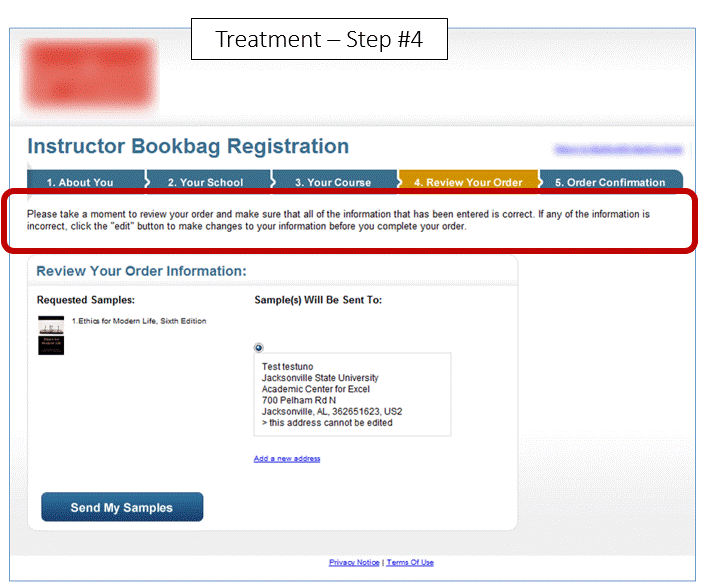 The treatment added an email capture field and changed the button copy from “Order Now” to “Continue to Step 2” while sending visitors to the same order page. What You Need to Understand: By changing the position of the call-to-action and adding an email capture field, we were able to significantly increase emails and also increase orders by 49%. 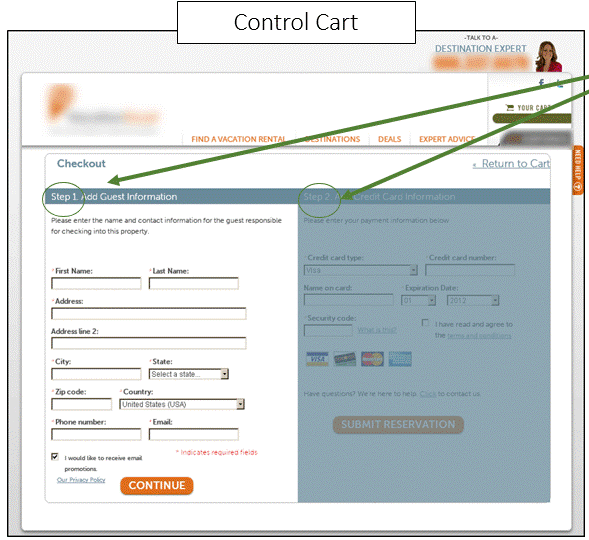 Research Question: Which checkout process will result in a higher conversion rate? 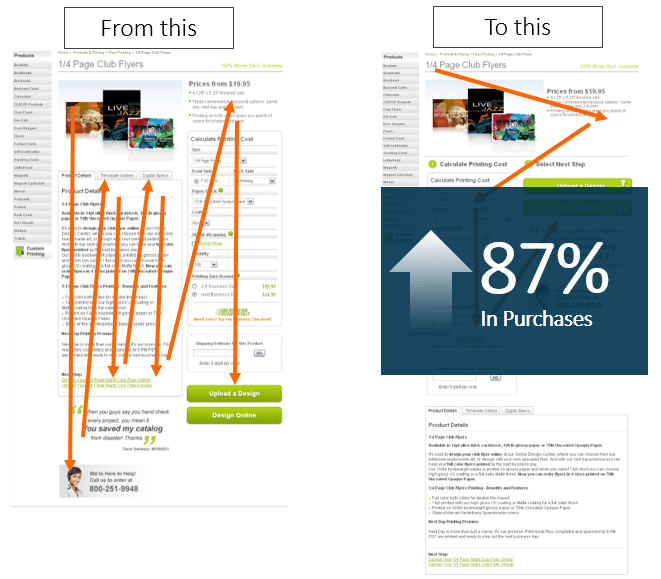 What You Need to Understand: By removing the unnecessary cart preview page, the treatment increased conversion by 28.60%. 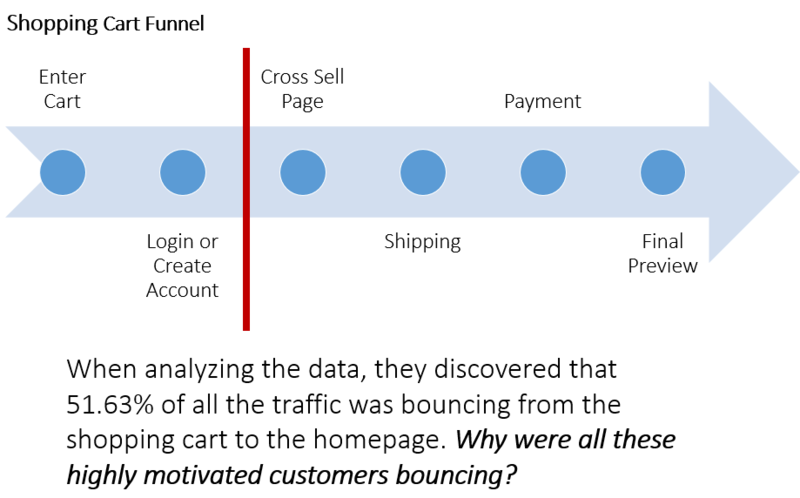 Background: An online people-search company that was losing many orders due to cart abandonment. 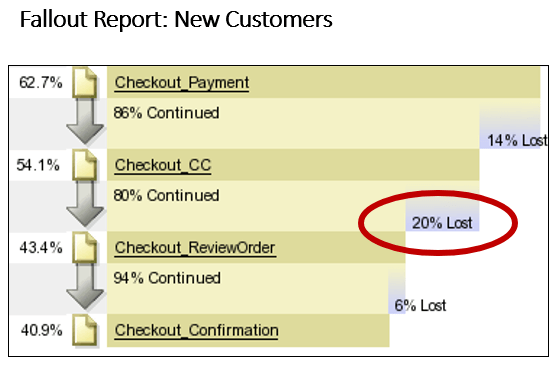 We wanted to find a way to recover as many of these orders as possible with a minimum incremental marketing spend. 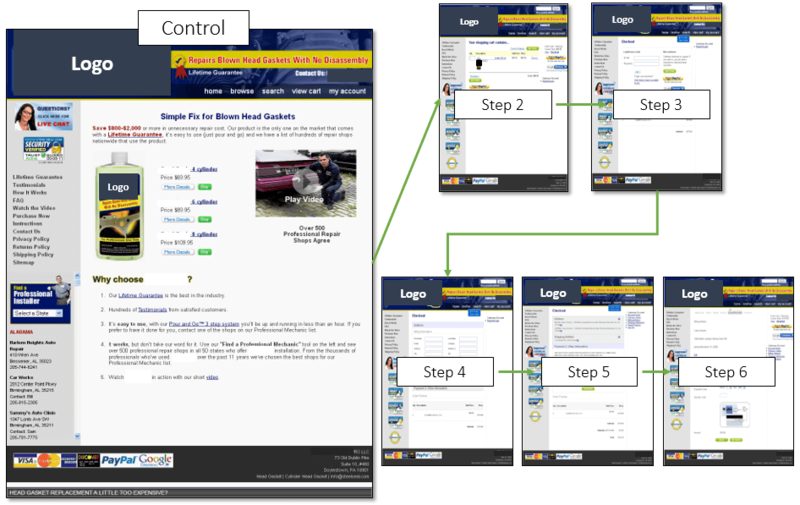 Primary Research Question: Which cart recovery sequence and offer will generate the most sales? 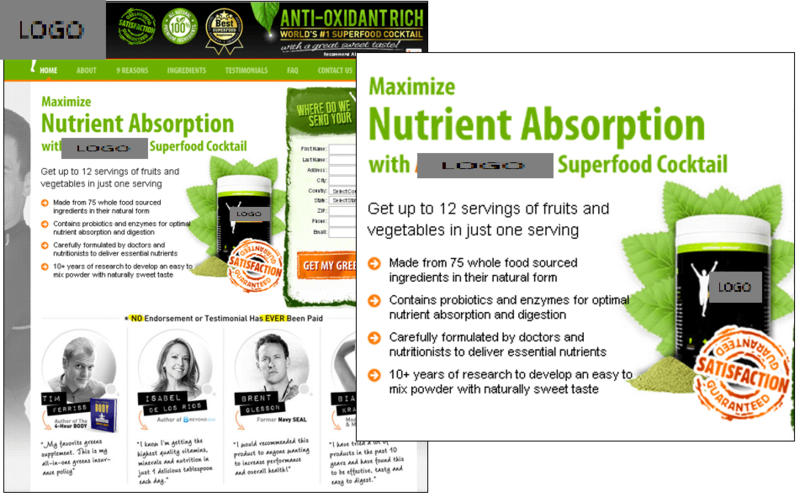 Background: This company offers prepackaged organic meals delivered to your home. They believed that the order minimum was hurting repeat sales. They began a promotion that reduced the minimum order. 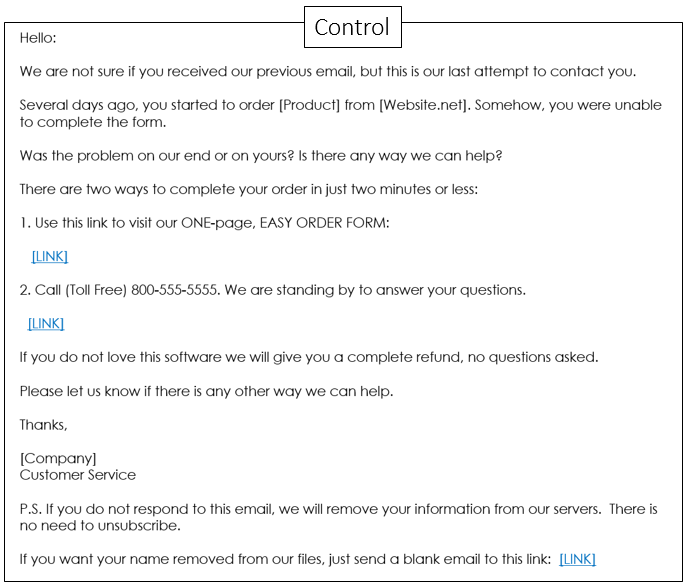 An email was developed to inform previous customers of this new order option. 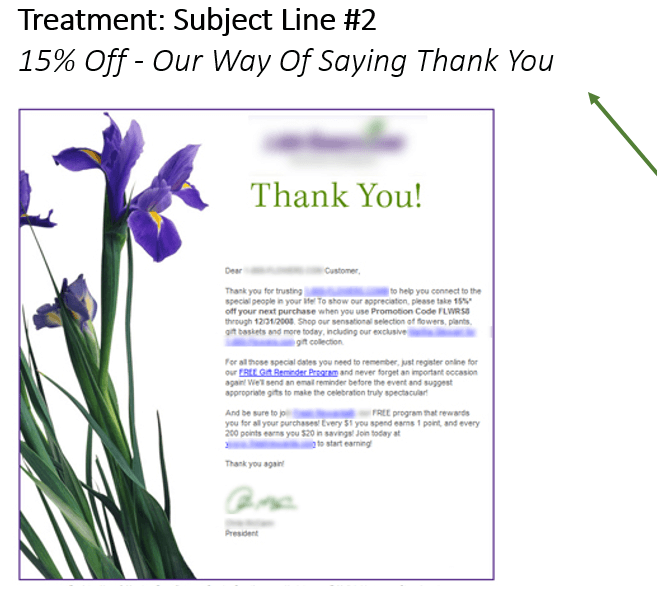 Primary Research Question: Which subject line will receive the higher open rate? 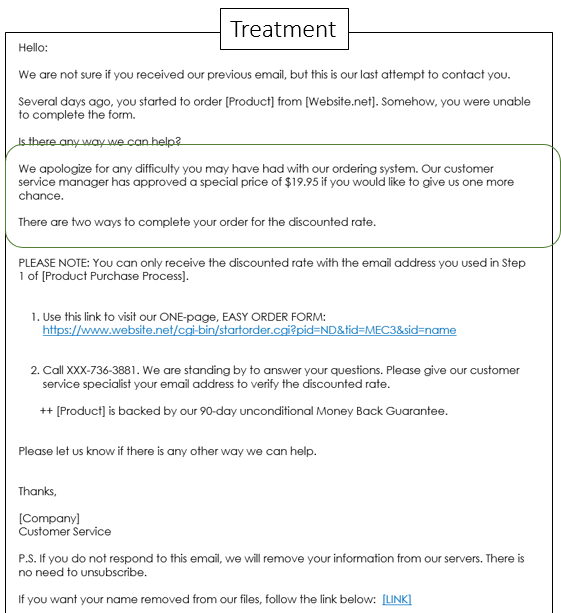 What You Need to Understand: By including relevant information about the reduced minimum order, prospects opened the treatment email at a relative rate 25.30% higher than the control. Research Question: Which email subject line will result in the greatest volume of return business? “Thank You For Making Us Your Florist of Choice” stated intention but did not make a clear offer. “15% Off - Our Way Of Saying Thank You!” stated the purpose and offer of the email message. 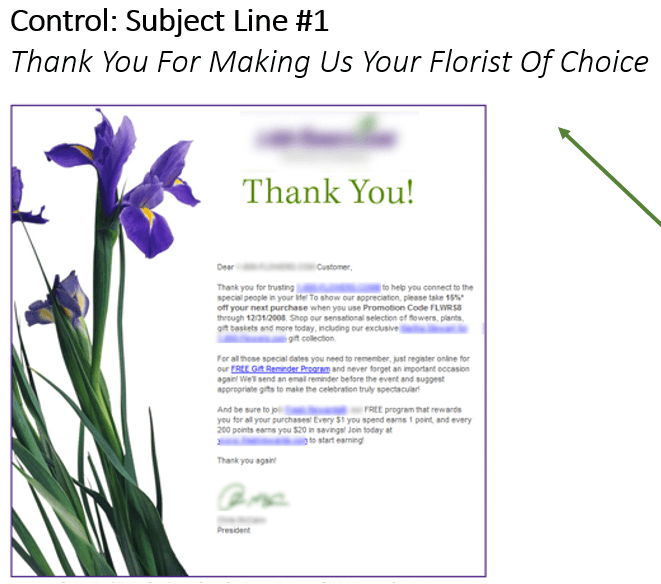 The email graphics and body copy were identical to the control. The offer-oriented subject line decreased open rate by 25.7%. 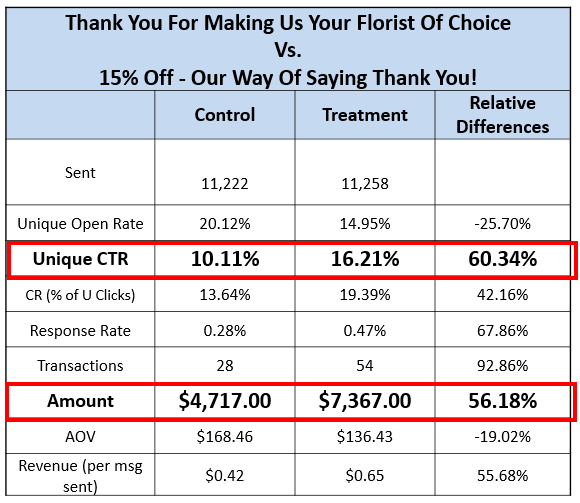 A deeper analysis of the metrics revealed that despite a significantly lower open rate, the treatment generated a 60% higher clickthrough rate and resulted in a 56% boost in revenue. What You Need to Understand: Looking solely at the open rate, one might conclude that the treatment underperformed. However, when drilling deeper into the metrics, it’s clear that the treatment outperformed the control. This underscores the importance of understanding the role of metrics in experimentation. Background: The company is a leading automotive head gasket repair solution. Research Question: Which landing page/cart will result in a higher conversion rate? 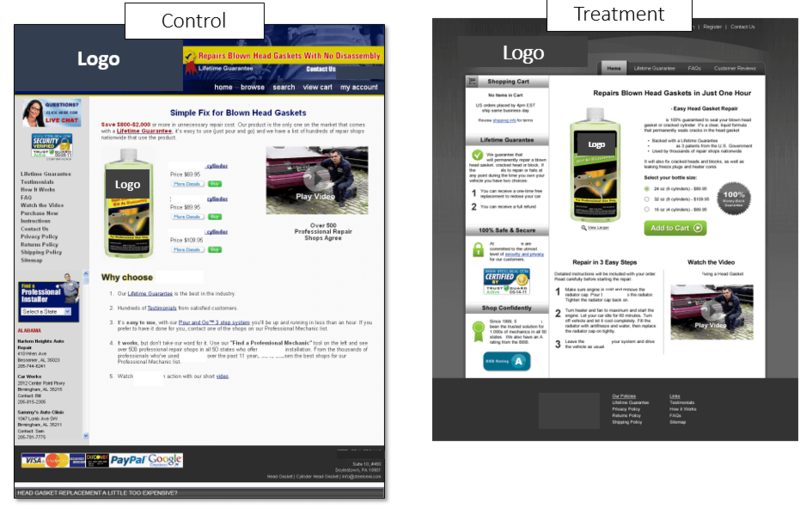 The treatment generated 58.1% more conversions than the control. What You Need to Understand: The reduction of friction throughout the process coupled with the single call-to-action led to a 58.1% relative increase in conversion rate. It is important to note that each of the designs incorporated a phone number that users could call to place an order. 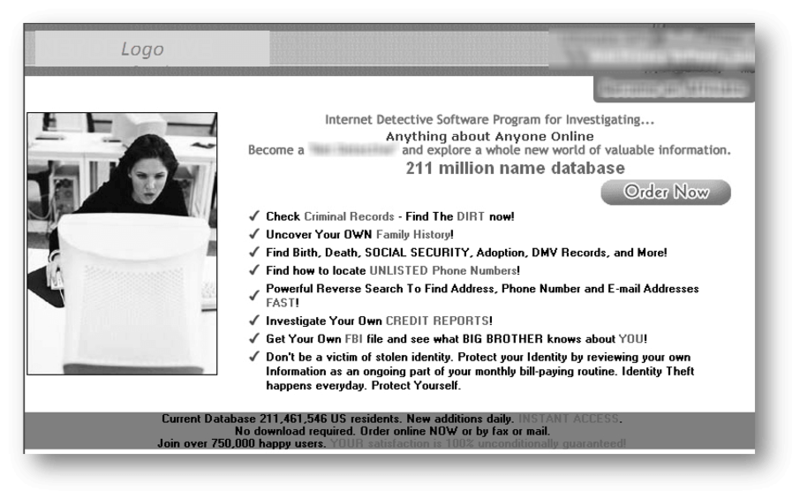 Conversion tracked through the phone call would make a difference in the results of this test. 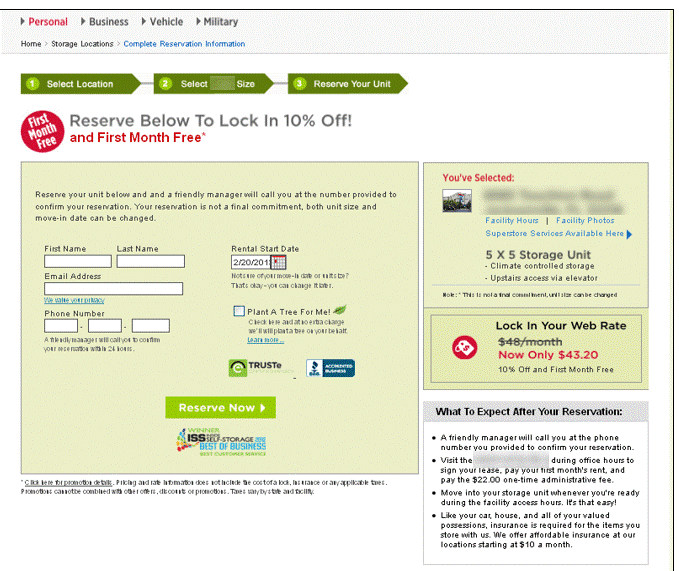 Without call-in center data, the treatment generated 13.83% more conversions. 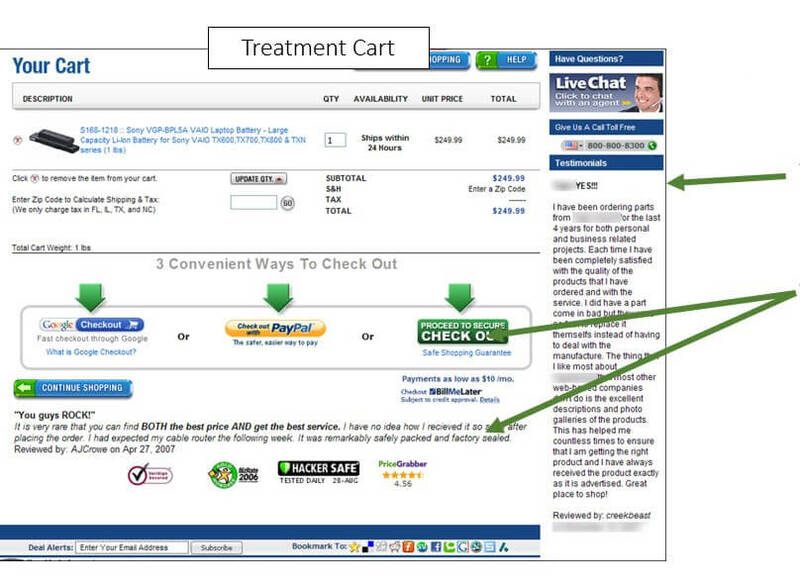 With call-in center data, the treatment generated 6.25% more conversions. 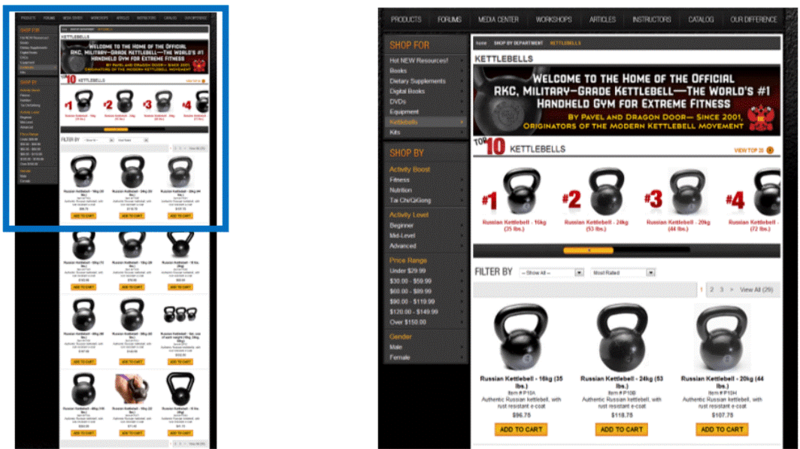 Primary Research Question: Which content approach will achieve a higher clickthrough rate? Based on what we learned from the previous content approach test, if we use a symptom content approach while matching the control's specificity to each ad group, we can achieve a higher click-through rate. 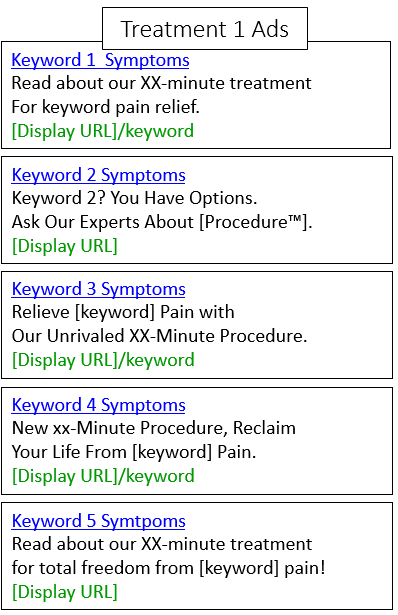 If Treatment 1 wins, we will learn that the symptom content approach is most effective only when used in the headline. If Treatment 2 wins, we will learn that the symptom content approach is most effective when used in the description and when the description is specific to the ad group. 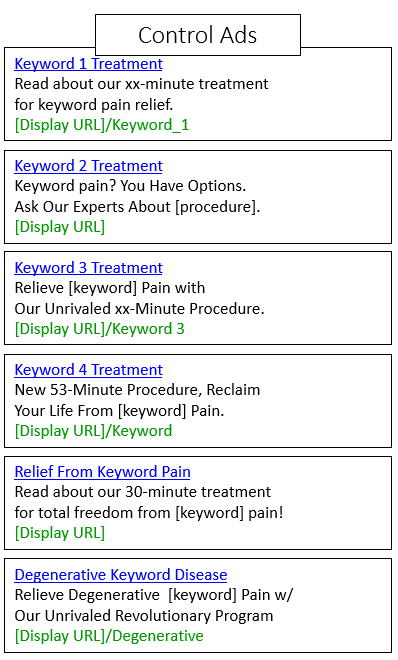 If Treatment 3 wins, we will learn that the symptom content approach is most effective when used in BOTH the headline and description and when the description is specific to the ad group. 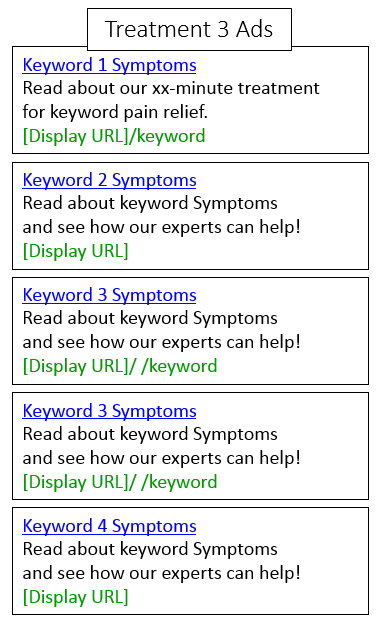 What You Need to Understand: Applying insight from the previous tests and inserting "symptoms" into both the headline and description created more successful treatments across all ad groups. 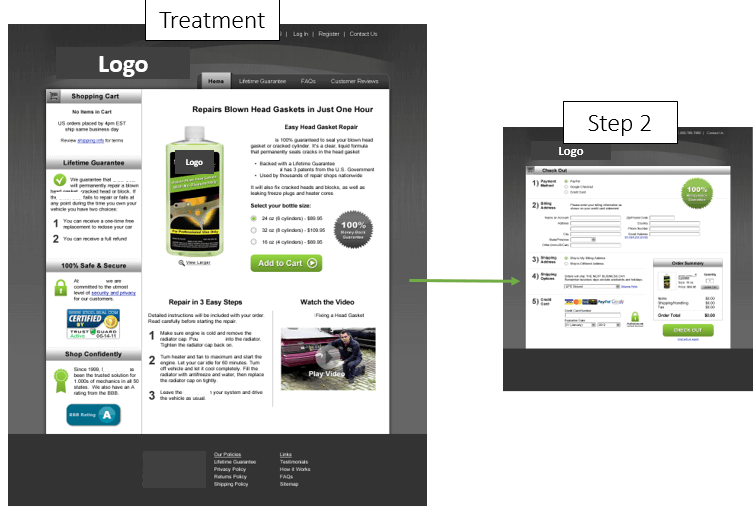 The treatment generated an overall 34% increase in the conversion rate. 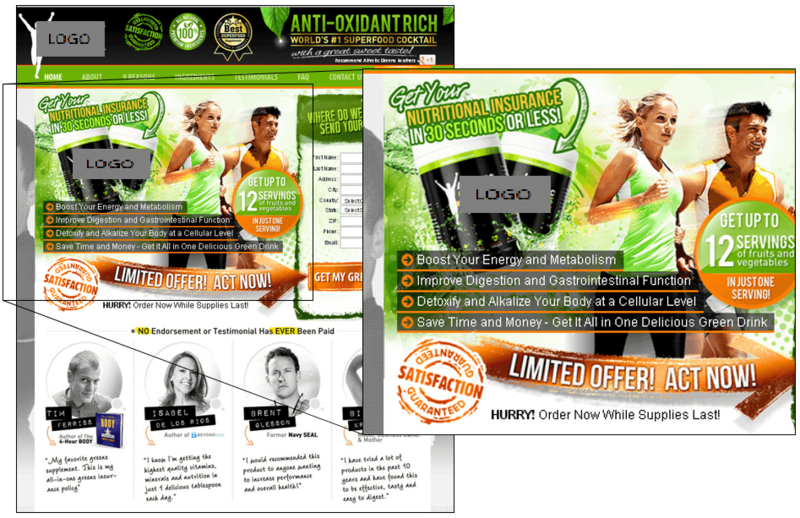 What You Need to Understand: By better expressing the value proposition through the copy and limiting imagery distractions, the treatment homepage not only increased conversion by 33.77% but also increased overall revenue per order by 39.95% at a 97% level of statistical confidence. Background: This research partner offers investors a place where they can purchase gold, silver, platinum and palladium for their portfolios. 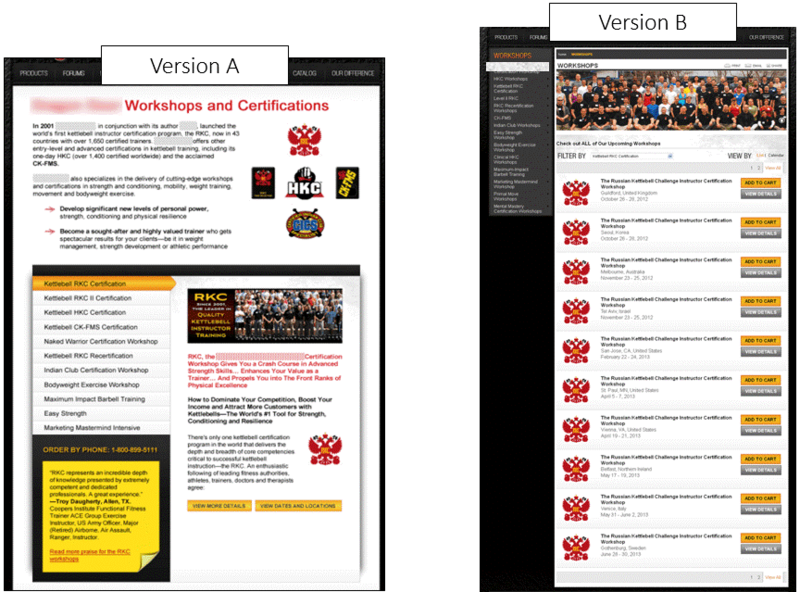 Primary Research Question: Which of the following pages will produce the highest registration rate? 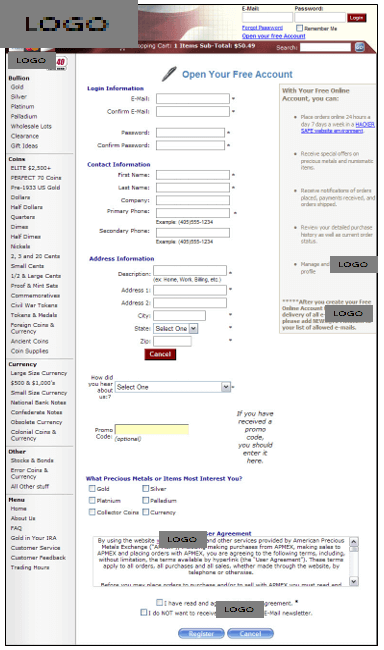 There are over 15 form fields and many are unnecessary. 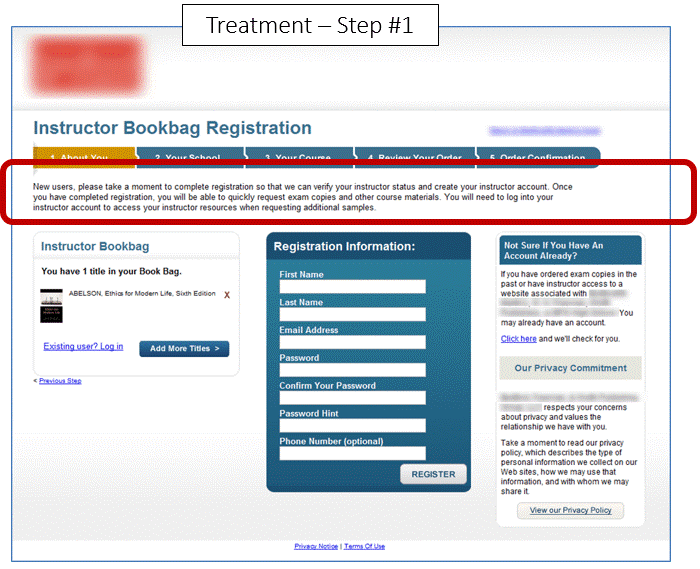 The navigation on the registration page is potentially distracting users from completing the desired task. Overall, there is a lack of third-party credibility indicators to alleviate anxiety. The treatment generated 56.16% higher revenue per order than the Control. 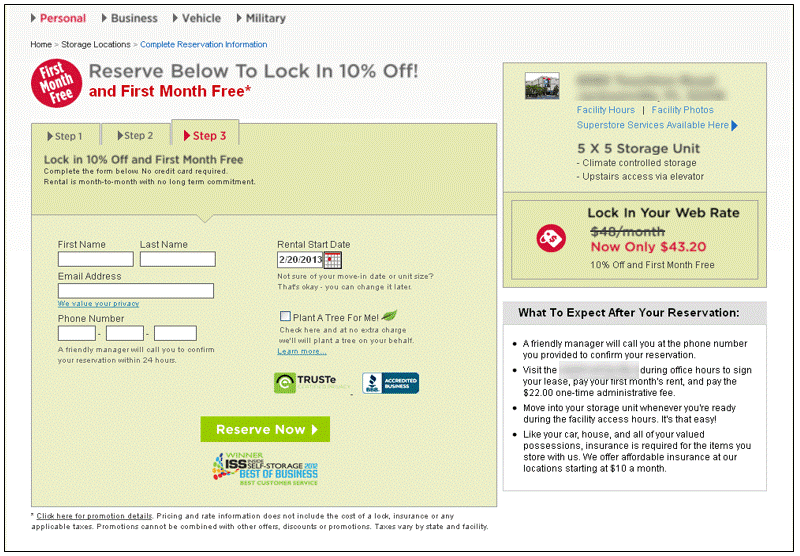 What You Need to Understand: Adding security seals and testimonials reduced anxiety and removing unnecessary form fields reduced friction to increase the money each customer was willing to spend. 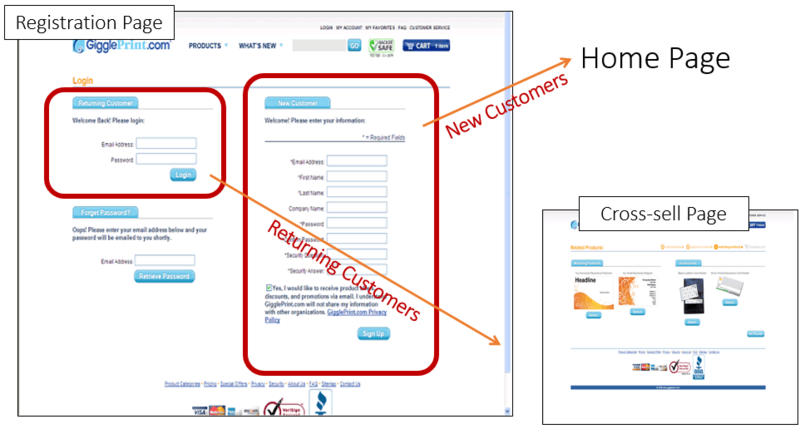 Primary Research Question: Which treatment will generate the highest conversion rate for new and existing users? 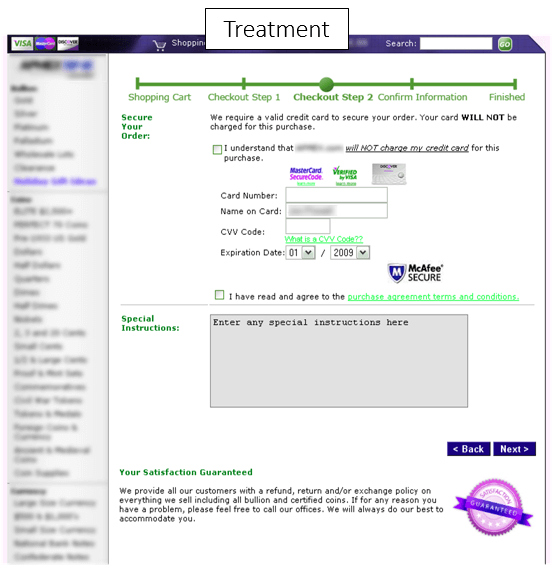 The treatment cart flow increased generated an 18.6% increase in conversion. 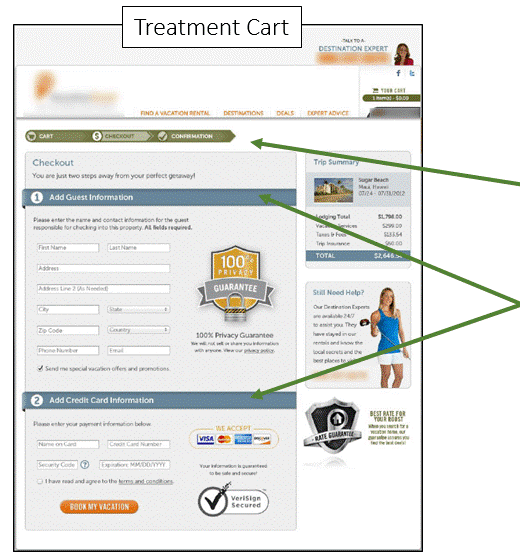 What You Need to Understand: By sequencing the cart and justifying each action the customer is required to take, the treatment cart process increased the rate of conversion by 18.6%. 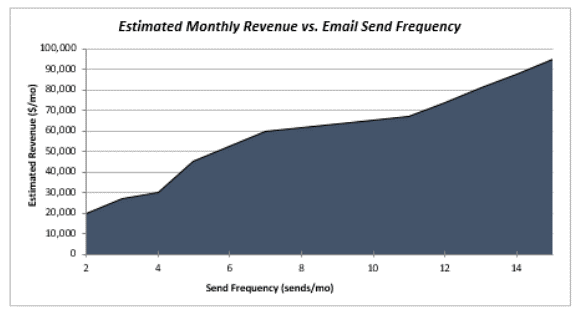 Projected monthly revenue rose consistently with increasing send frequency and the number of sends did not have a significant impact on the overall rate of transaction. 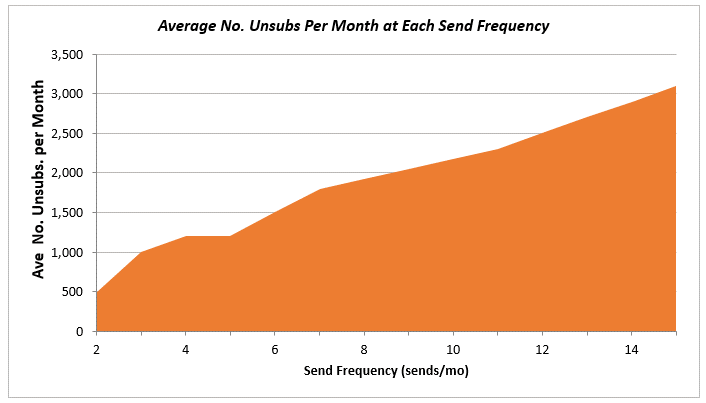 … the unsubscribe rate on a per-message basis does not rise significantly. This does not suggest a greater level of irritation, but rather simply more unsubscribe opportunities offered at higher frequencies. 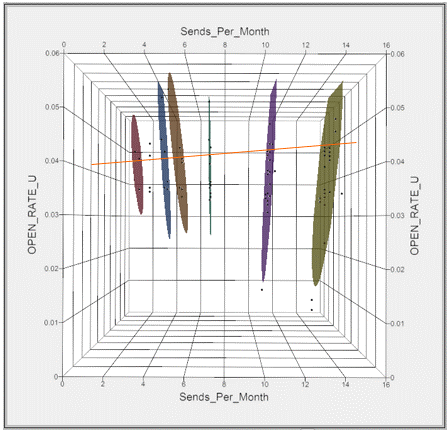 Open rate also does not appear to be significantly influenced by send frequency within the range of frequencies tested. 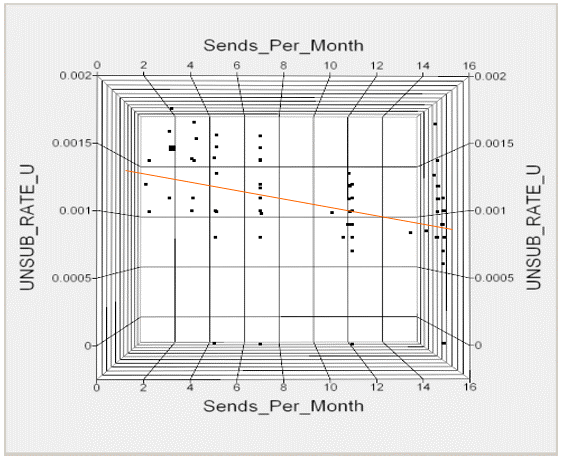 There is no significant correlation evident between send frequency and open rate. What You Need to Understand: This company is losing three times its revenue by sending email only once a week instead of every other day. 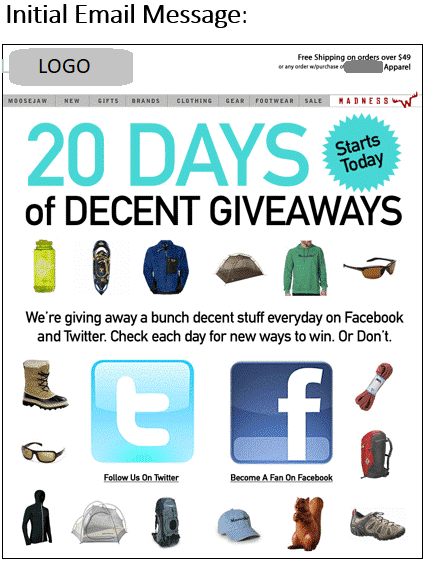 More frequent email sends won’t increase unsubscribes or decrease open rates. 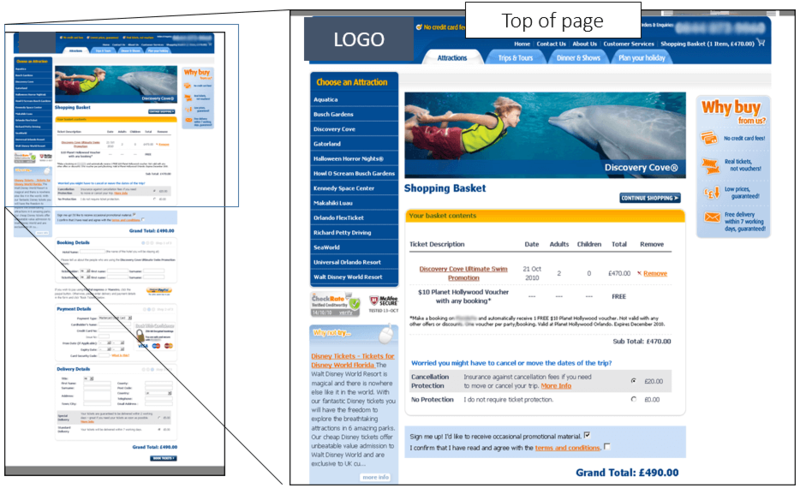 Primary Research Question: Which category page will generate the highest order rate? 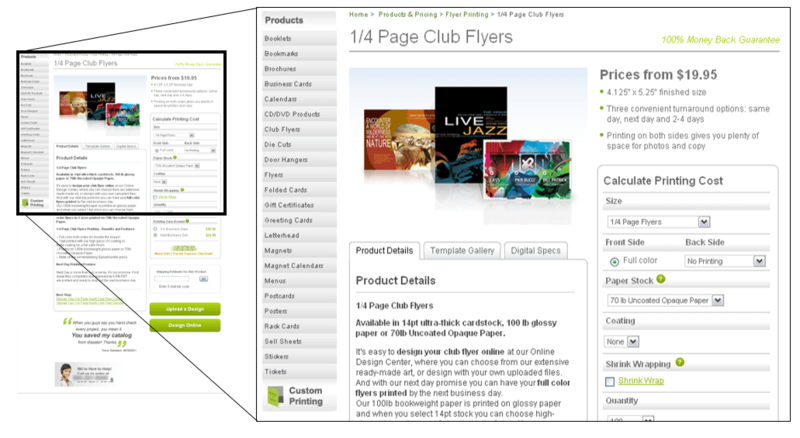 Category template A increased visit order rate by 19.9%. What You Need to Understand: Removing the copy and moving the customer straight into course selection better matched motivation and increased orders by 19%. The “view details” call-to-action increased email clickthrough rate by 13.04% when compared to the “shop now” call-to-action. 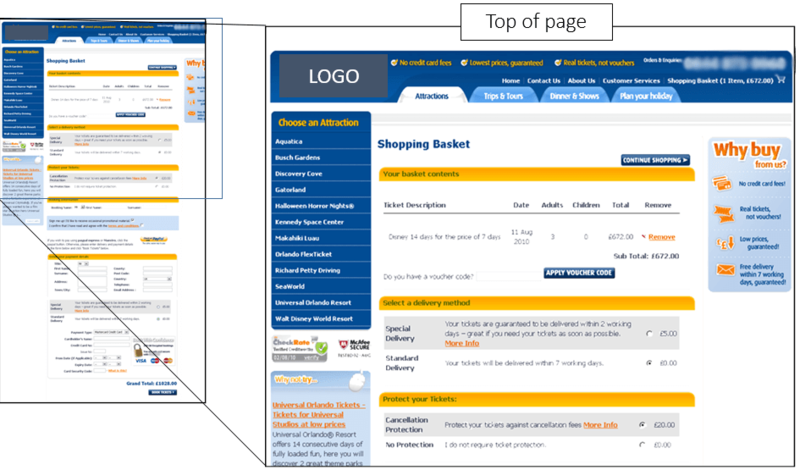 The new category template B increased visit order rate by 61.2%. 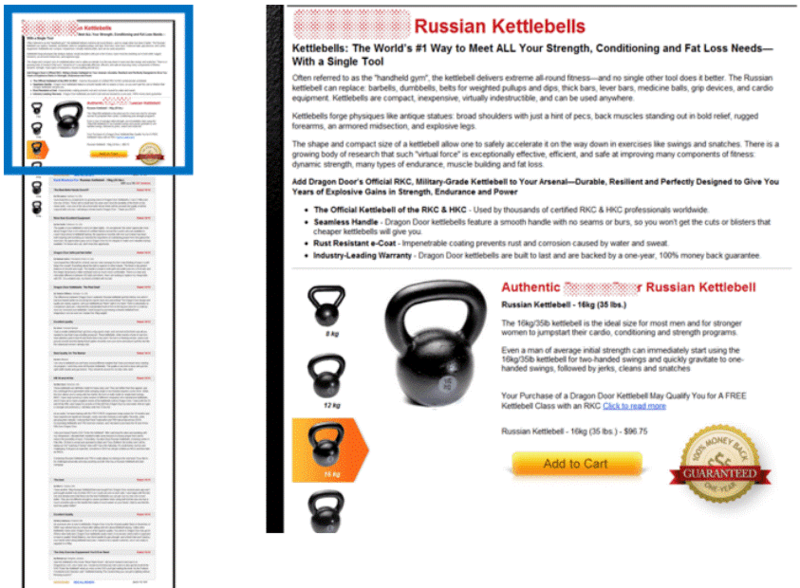 What You Need to Understand: Adding value copy to help the customer understand what a Kettlebell is and how it can benefit them increased the value exchange and increased purchases by 61%. 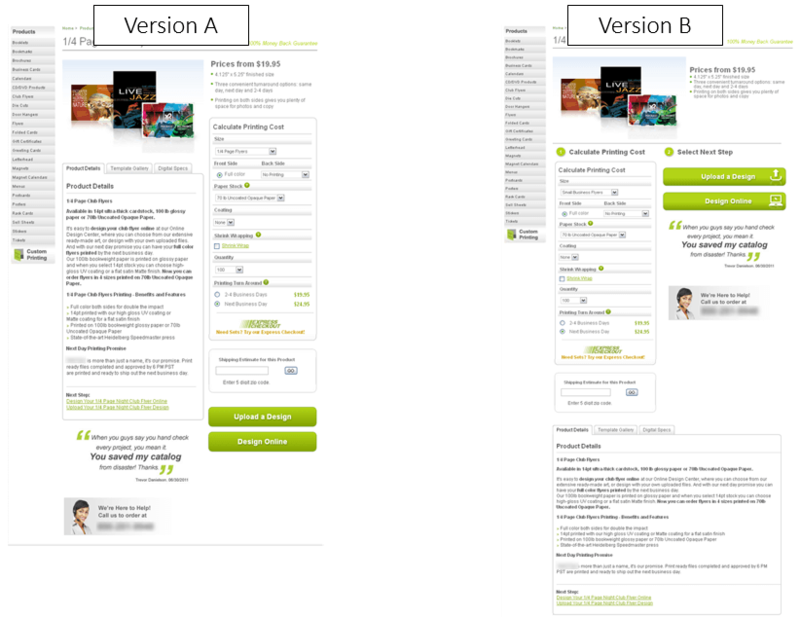 Primary Research Question: Which page copy will generate the highest sales conversion rate? The additional copy was placed at the top of the page. It focused primarily on building the problem. 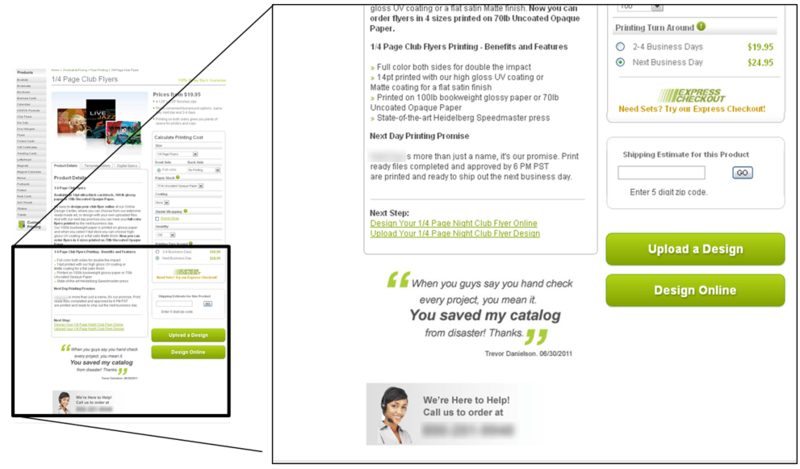 What You Need to Understand: Adding copy to the top of the page that immediately identified the customer’s problem and how the product would fix it increased the value exchange and increased sales by 36%. 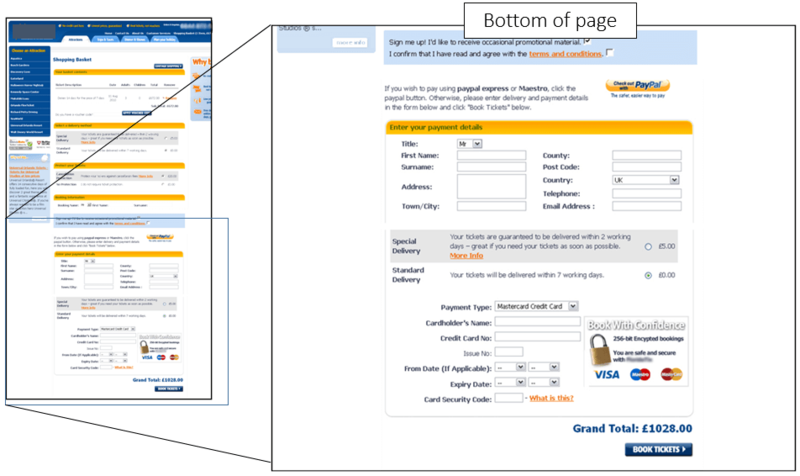 Research Question: Which checkout page will result in the highest reservation rate? What You Need to Understand: While it might seem like a small increase, the addition of a progress bar in the checkout resulted in a projected $3,000,000+ increase in revenue per year. Background: The research partner is a one-stop vacation planning solution that allows users to book vacation rentals, car rentals, and activities. 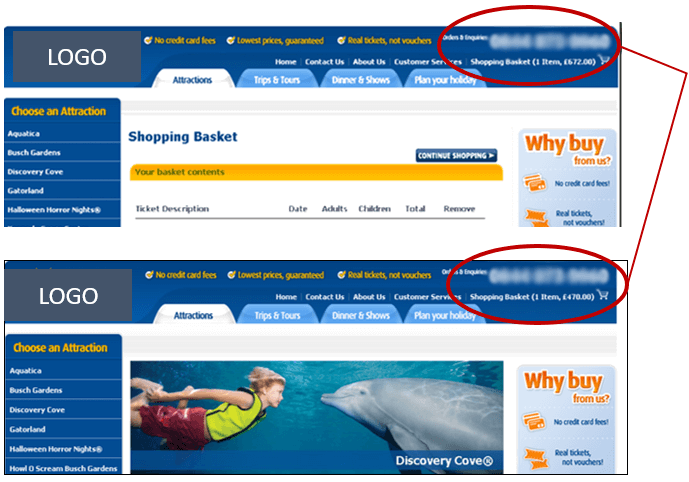 Research Question: Which page will yield the highest conversion rate from billing information to confirmation? The horizontal flow, as well as the blue shading, made it difficult for visitors to get a sense for the sequence of the cart. The treatment also sequenced the two steps vertically. 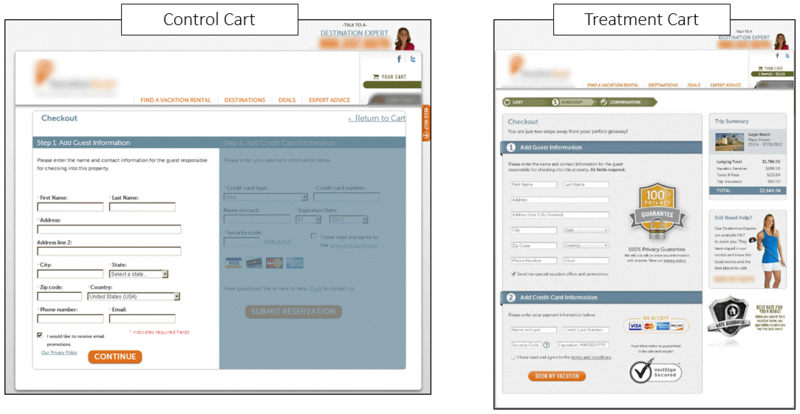 What You Need to Understand: By clarifying the sequence in the checkout process, the treatment generated 36.1% more total conversions than the control. Research Question: What will help grow engagement with our social media channels? How can social media impact sales? 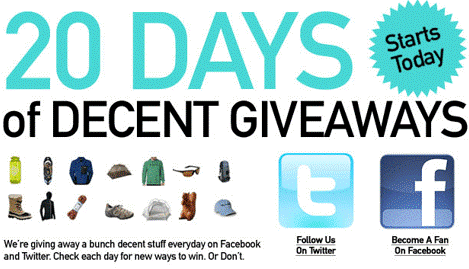 For the duration of 20 days, the brand hosted multiple give-away contests via Twitter and Facebook. To enter, one was required to comment or retweet. Contest timings were random, and entries were only accepted for 30-45 minutes per contest. Winners were selected by a random generator. The contest was mainly promoted on Facebook and Twitter. There was also a rotating banner on their website as well as an initial announcement email. "We’re giving away 5 pairs of … Renton & Latika Fleece Jackets. Retweet #WINMJFLEECE to enter to win. We’ll pick 5 randoms at 2:30 EST"
Overall, the team captured 45% more Twitter followers during the effort, bringing their total to more than 5,600. They also captured 31% more Facebook fans, bringing their total to more than 20,000.